Invented in 1928, dental veneers have helped millions of people attain the beautiful smile they always dreamed of. The incredibly thin, perfectly-shaped, and excellently-colored porcelain shells help patients to cover up their dental imperfections, revamping the sparkle in their smiles. Cosmetic dentists use this technology to provide remedies to some of the most stubborn teeth problems such as crookedness, cracks, and discoloration. According to dentists, veneers can last for as long as 15 years with proper maintenance and less than 5 years if otherwise. Here is a close look at five proper care techniques that will keep your dental veneers in excellent condition for years to come. Brushing with a fluoride-rich toothpaste after every meal for at least two minutes per session. It is true that dental veneers are durable and can withstand high amounts of pressure. However, that should not be taken as a license to eat recklessly and unnecessarily strain your teeth. Avoid chewing on hard, crunchy foods or risk damaging your veneers. If you grind your teeth, probably as a habit, make a conscious effort to stop because you are destroying your veneers and your natural teeth. Unlike your real teeth, veneers are not able to cope with the stress that comes with teeth grinding. If you suffer from bruxism, notify your cosmetic dentist beforehand so that he/she can install occlusal guards to protect your veneers. Using a hard toothbrush throws the shine and polish of your dental veneers into jeopardy. There is a chance that your gums could be destroyed by such toothbrushes, leaving your veneers exposed. Using abrasive toothpaste, on the other hand, can rub off the polish in your veneers. Smoking is a leading cause of staining in teeth, so avoid it at all costs. Beverages such as coffee and red wine are also known to discolor teeth. 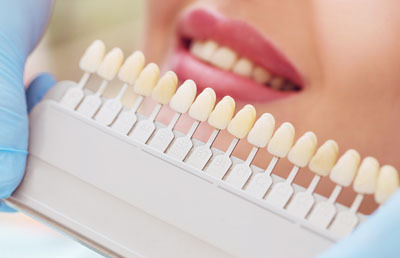 Even though veneers can resist stains to a certain degree, your natural teeth cannot. Remember our rule of thumb? A beautiful smile can change the way you feel about yourself. By taking proper care of your dental veneers, you ensure that your smile will be preserved for a long time. Contact Asha Dental at (913) 971-4163 to find out more about how you can improve your smile.